Please plenty of people with Cracked Pepper-Parmesan Crisps! Saying that 10 times fast might be hard, but these parmesan crisps are easy to bake and fun to serve. Combine cheeses. Spoon into 15 mounds, 2 inches apart, on baking sheet, using about 1 Tbsp. cheese mixture for each. Flatten mounds slightly. Sprinkle with pepper. Bake 6 min. or until golden brown, rotating baking sheet after 3 min. Transfer immediately to wire racks; cool completely. Enjoy eating appetizers at a social occasion, but be mindful of portion size so you don't overdo it on calories. Substitute ground red pepper (cayenne) or smoked paprika for the black pepper. 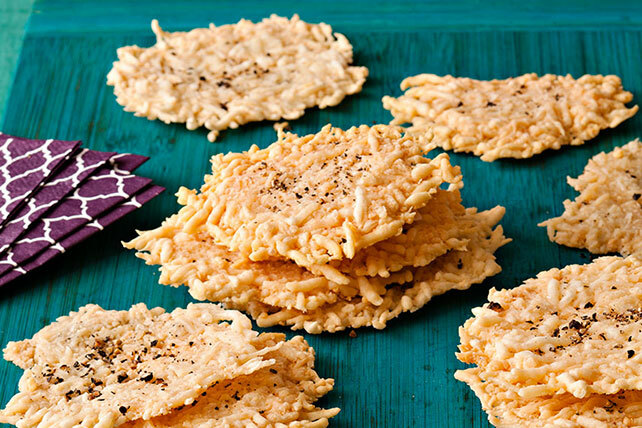 Since these tasty Parmesan crisps can be made ahead of time, they're the perfect treats to serve at your next holiday party. Please note it is important to cool the crisps completely before storing in airtight container at room temperature until ready to serve.